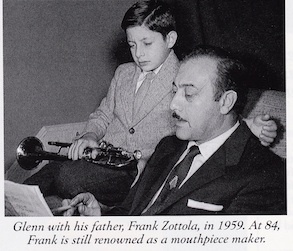 My dad Frank Zottola was a great trumpet player , arranger , conductor and mouthpiece maker but most of all a truly wonderful person loved by all. The world is a better place for him having lived. This is an arrangement he did for the Claude Thornhill Orchestra in 1941 . This arrangement and song is a beautiful representation of your father, and you too, Glenn. thanks Ira we were both so fortunate and we both represent their influence well. Happy Fathers day !! IT WAS SUCH A THRILL TO SEE DAD AGAIN AS YOU KNOW AND WE ALL DID RESPECT AND LOVE HIM HE WAS A WONDERFUL WONDERFUL MAN A GREAT FRIEND CONFIDANT IN PERSON. YOU HAVE TO KNOW GLENN THAT YOU’RE KEEPING THE MUSIC ALIVE AND IT IS OUT STANDING. VERY PROUD OF YOU GLENNE YOU MADE IT TO THE TOP AND YOU’RE NOT GOING TO STOP. thanks Alan I appreciate that ! !